The health minister has ruled out introducing compulsory MMR vaccinations saying it could make matters worse and damage trust in health professionals. Wales is currently suffering its worst outbreak of measles since the introduction of the vaccine 20 years ago, with 302 cases across the country. 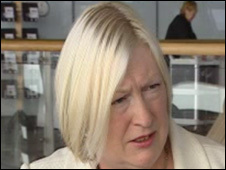 Edwina Hart said she would concentrate on providing reassurance "based on sound scientific advice" to parents. She had been considering MMR as an entry requirement for school. Uptake of the MMR vaccine fell sharply after now-discredited research suggested it carried a raised risk of health problems. To date, 36 people have been treated in hospital because of measles. In a statement, Ms Hart said: "The rising number of measles cases necessitated a fresh look at compulsory MMR vaccination and this has been undertaken. "My conclusion is that compulsion would adversely affect the trust that most parents have in local health professionals. "It would give rise, inevitably, to issues of compulsion and actions which would have to be taken to deal with those who refuse to comply with compulsion. "It would, on the advice I have received, make matters worse, not better." She said a new information campaign about vaccinations including MMR was needed, and a new national leaflet would be sent to every household in Wales. "[It will] build on the confidence which most parents and patients have in the information they receive, and reinforce the messages about the importance of vaccination in current circumstances. "The leaflet will cover MMR vaccination, but go beyond it to provide information about vaccination in other areas, too." Every local health board is expected to have a full-time employee co-ordinating immunisation policy by October 2009. Ms Hart added that suggestions to carry out research in outbreak areas would be considered once the outbreak was over to find the reasons behind the decision not to vaccinate. She also urged grandparents and older community leaders with experience of the impact of serious diseases to support parents making decisions "based on sound science not myths perpetuated through questionable internet websites". Children in the UK are offered vaccination against measles as part of the MMR triple vaccine which is also designed to prevent mumps and rubella. It is given to them between 12 and 15 months of age along with a booster dose before they start school. After debate on the subject in Cardiff Bay, Sir Sandy Macara, a former chairman of the British Medical Association, backed a compulsory MMR vaccine saying he believed children should not be able to go to school unless they have first been vaccinated. Sir Sandy has submitted a motion for debate at the annual BMA conference later this month. The Strategic Health Authority for London has asked the Department of Health if it could introduce compulsory vaccinations and the right to insist on an immunisation certificate.